In October 2004, I (Andrea IK1PMR) was just enjoying giving a talk at a great annual SP DX Club meeting in Bydgoszcz (Poland) to present the T33C expedition to Banaba Island and I was still unable to answer the usual question “Where do you go next?”. Few days later in Warsaw, I received an email from my friend Silvano I2YSB, asking if I could be interested in joining the 6O0CW DXpedition. I was aware of plans for Africa expeditions; now the license for 6O was guaranteed, so my reply was instantaneous, as I never refused any invitation to rare DX activations. Adriano IK2GNW was also involved in the organisation and applied for the 6O0G callsign, but at last minute unfortunately he was unable to join the DXpedition due to health problems. The team was quickly completed by Beppe IK2WXV, Marcello IK2DIA and Riccardo IZ5BRW; all of them were already part of DXpeditions to 5U Niger in 2002. Planning proceeded with hundreds of emails and phone calls until our departure on 01 February 2005. Our supporters Carlos LU4AE and Luciano IW1CPG were so kind to accompany us and all our equipment to Malpensa airport, near Milan (Italy). Checking-in our large and unusual baggage at the Alitalia desk was the first difficulty to face; they were unhappy to accept our wooden/aluminium boxes containing our precious antennas, but at the end everything went smooth. Landing in Dubai (United Arab Emirates) on time with all our baggage was a good start. However, the UAE security didn’t like our cases full of cables and accessories, and they decided to lock three of our boxes until the next day, when we’ll have to check-in with Daallo Airlines for our next flight to Djibouti. We spent about 20 hours in Dubai, a very dynamic and interesting city, with a wonderful weather but huge traffic jams. There are shops and markets everywhere and at any time, trading is the essence of the city. People from all continents meet and make business here. It was no problem for us to find in Dubai the last items we needed, including some robust tape to reseal our boxes opened for security inspection! At 01:00am we were already on a truck with our baggage, ready to recollect our large boxes from the security office and then check-in at 04:00am for Djibouti. A security officer accompanied us step by step through the airport until he was sure that all of us and our boxes were really checked-in! The flight to Djibouti was comfortable and no problem. There we had to wait few hours, then we boarded an old ex-USSR Antonov AN24 airplane to Somalia. It was a very small plane, really crowded with any kind of passengers and baggage everywhere!In about two hours we reached our destination Galkayo (6:47N, 47:25E), in the Puntland region of Somalia. A quick look from the window immediately revealed the city structure: a large array of square buildings, almost all the same size, same color and same plain roof. Streets were simply a mix of dust, stones and holes of very different sizes. All of this, of course, under a strong sun. Being the last one to get on the plane, I was now the first of the team to set foot on the land of Somalia. It was a great pleasure and a great assurance to see Adan 6O0N, local ham and Director of Radio Daljir, come to me and energically shake my hand, immediately followed by professor Hussein and others. Our identity was obvious from the color of our skin and from the hat with the “6O0CW” callsign on it (an essential item under the sun at those latitudes). I was quick enough to make a picture of the other team members getting off the plane, but no more; I was immediately blocked by several persons asking for “no camera”. So you’ll understand why our documentation of the expedition is quite poor: we always had to ask permission before making photos or video, and several times we didn’t obtain such permission. We moved behind the airplane wings, in search of some shadow. Adan immediately collected all our passports without long explanations (the reason was VISA applications and radio licensing, as it became obvious later). Then he and Hussein, a smart professor of chemistry who speaks a perfect italian (and english), accompanied us to a guesthouse in Galkayo city, which will be our main base and the place where we’ll setup our first station. We immediately unpacked our baggage at the guesthouse. Personal clothes and items were limited to a real minimum (3 kg maximum per person), so it was a matter of minutes to unpack it. Then the team started assembling the first antenna, a vertical for 30/40/80m. I was the only one in the team to be exonerated from antenna work. So I was in charge for making video and pictures of the setup phases, plus some public relations activities that lead me to a good lunch. To my surprise, after a Somali soup, I found myself eating good italian spaghetti with Hussein, who spoke to me in perfect italian. To my surprise, the owner of the restaurant spoke italian too, and he spent 5 years in Torino. Of course I was prepared to speak english or other languages and to eat rice or camel for this PR lunch too, but eating pasta with italian speaking people made me immediately feel better and probably made things easier for everybody! Some common cultural background was evident, and the malaria tablet I had to take was the only aspect that reminded me I was in Africa and not in Italy in that specific moment. In the afternoon, before sunset, despite being tired we had to hurry to find suitable pipes to erect our antennas and a generator to overcome frequent power faults. Hussein was an invaluable helper for these logistic tasks, and for many more later. We went to a private house to pickup a generator. Our first visit to a Somali house was a surprise: no floor, no real bathroom, a lot of mosquitos everywhere of course but, on the other hand, satellite TV and internet connection were available! A contrast that is difficult to describe. We’ll find the same scenario in other houses, schools and radios later. By sunset time, the station at the guesthouse was ready to go on the air with a Yaesu FT-847, 500w solid state amplifier and 30/40/80m vertical antenna. But our new friends invited us to go out for dinner. We could not refuse their kind offer, but on the other hand we knew that thousands of DXers worldwide, and our ham friends at home in particular, were waiting for us to show up now, and some of them would worry otherwise. I was the only one of the team who had real food at lunch, the more relaxed and one of the CW operators who could start on 30m, probably the best place to be given our initial limited setup at that time. So I started the operations at 15:00 UTC on 03 February 2005 signing 6O0CW on 10118 kHz, the lower frequency that sounded quiet on 30m. It was not a surprise to generate an instantaneous huge pileup on 10119 and up. I was prepared to this, and all of us were looking for this! 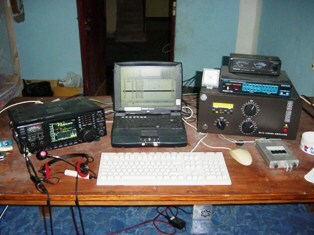 The first QSOs were made with European and UA9/UK9 stations. Very soon, several very familiar callsigns were logged, and I was happy to have the opportunity to send them “all ops ok, vy fb, pse phone home” to few good friends. Within the first 3 hours of operations, many of our I1/I2 best friends were already in the log, including: I2UUA, IK2GNW, I2KMG, I2KAJ, IK2DFZ, I2TAO, I1POR, I2AOX. When the other team members came back from dinner, they told me about checkpoints on the road by armed groups. All went smooth because they were accompanied by our Somali friends, nevertheless we understood that night time is not always a safe time for visitors. It was the only time one of us was left alone, we always splitted in two groups of 2-3 persons since that first evening. Soon we had a power fault around local midnight (as we’ll have every day, and also in the afternoons). Our “generator man” Marcello IK2DIA was infaticable each night to check, refill and restart the generator as many times as needed. Security at the guesthouse was guaranteed by an armed guard all and each night, sitting or sleeping just few meters from our antennas. The next day we surveyed places suitable for installing our second HF station. We decided to setup it at Radio Daljir, a 103 MHz FM broadcasting located in Galkayo about 3km from our guesthouse. The place has little facilities and 3km on Somali roads under a strong sun or (even worst) at night is not a quick or easy path. However, the choice was highly motivated by the presence of a 50 meters tower nearby, which we could use for our 160m inverted-V dipole antenna. We understood that Somalia is pretty rare on 160m, and at this time of minimum solar activity we believe that the low bands deserve even greater consideration. It was not difficult to find a young “volunteer” to climb the tower and install our dipole at about 45m above ground, for a contribution of few US$. He did the job quickly and he was happy; we were happy too. The sun itself at ground level was enough for us, no need to climb such tower! Our objective was to be serious on the low bands, so we brought with us a 180m long beverage too. Unfortunately we were located in a large town (someone says Galkayo has about 200000 inhabitants, others say more, nobody really knows); this means that there was no space to place our beverage, except … running it on top of the roofs and crossing several streets about 3.5 meters above ground. It was an hard work under the sun, with some 50 children around us. A vertical for 80m and a 7-bands vertical were also erected. The station was an IC-756pro-III, ACOM-1000 power amplifier. From 04 to 16 February, every night two of our mainly CW operators (I2YSB, IK1PMR, IK2WXV) had shifts to Radio Daljir to operate the low bands station. To go around after sunset and come back at sunrise, we had to hire a driver, because it’s a bit dangerous to move around alone, and it’s also quite difficult to find the way (there are no signs or lights of any kind on the streets, just holes). Around 10:30pm we were usually locked inside Radio Daljir, with armed guards outside, to guarantee security for us and the broadcasting equipment. Galkayo is now considered reasonably safe (compared to the capital Mogadishu), however many people own weapons and fire shots were heard almost every night, so one needs to know how and where to move around, especially visitors, and advice from local people is essential. The top band offered us great satisfactions on several nights, from 20 UTC until our sunrise around 03 UTC. On few occasions we were able to work several US stations, with EU at the same time. JAs had good signals sometimes early in the evening (their sunrise), Mike VK6HD was incredibly loud on 80m and top band. We transported a bed with mosquito net in the radio room. Sleeping was almost impossible due to hot temperature, lights, noise, and so on, but at least we had a mosquito-free place to relax until sunrise, when our driver will come to bring us back to the guesthouse for few hours of sleeping. Our typical day included a light breakfast with tea and biscuits, some rice or pasta with camel meat at lunch, then tea again for a very quick dinner, with shifts to keep our stations running 24 hours a day, except when we had to attend social events which took priority. During the day, operations took place on the high HF bands, with a lot of EU at any time, some JA in our morning and NA in the afternoon. US east coast and mid-west were no problem and we were able to log 3380 NA contacts on all bands from 10m to 160m. Few times, we also managed to hear our friends Gian I1POR and Claudia I1/K2LEO on sked at 13:30 UTC for a quick update. All the operators were 100% OK, except for some fever affecting one of us for a couple of days. Dr Abdul, an italian doctor who resides in Galkayo was so kind to visit us at the guesthouse and gave him adequate medical advice. This fever, together with other logistics problems and equipment faults, prevented us from seriously participating in the RTTY WPX as planned. We focused on digital modes on 15m (the overall best band for us) for the last few days, managing to log 1062 QSOs on RTTY. We understand that a huge demand still exists for 6O on digital modes. The most difficult challenge by far was hearing W6s and W7s. We were aware of this of course, and we were looking for them every afternoon before our sunset on CW (being the most efficient mode and the preferred mode of three of us). Propagation is what it is at the bottom of solar cycle, but what made us lose precious time and contacts was the behavior of few EU operators, who were unable to understand “nw pse USA USA USA” and “pse EU QRX” when we were desperately trying to copy very weak signals arriving long path from the US west coast.We even had someone insisting with “pse EU EU” on those precious short openings with W6s and W7s. This is not true ham spirit or DX expertise, if you consider that we worked EU at least 22 hours a day on all bands from 160m to 10m on every single day! The results speak for themselves about EU presence in our log.Many W6s/W7s are also our good sponsors and friends, and we can’t see why we should not try to work them for few minutes a day on such a difficult path. People who can’t understand and accept this simple fact are not true DXers and true gentlemen in our opinion. It’s simply unfair to destroy months of planning and preparations just because one needs 6O at that specific hour of the day (maybe for the last band) when we’re trying to give an all-time new one to DXers living 15000km away. We had the best 20m openings to W6/W7 on 13 and 16 February, always long path around our sunset (14:30 – 15:30 UTC). We tried CW only, of course. 30m and 40m were a bit more stable, with few openings at our sunrise too, but the signal to noise ratio wasn’t better. We also had limitations on 20m due to unresolved interference problems to the broadcasting station audio frequency system. RFI problems on all other frequencies were fixed. Public relations were essential in 6O. We were guests in a foreign country where a visitor can’t really do much alone, without help from local people. Somali were very helpful and friendly with us. They helped for logistics, food, internet access, VISAs, licenses and much more. Somalia is indeed a country which looks forward for development and peace, after a disastrous 14 years long civil war. We really thank our local friends, in particular the Directors of Radio Daljir and Radio Galkayo and their staff for outstanding help and hospitality. Amateur radio has been reintroduced in Somalia by Sam Voron VK2BVS / 6O0A (who was in Australia at the time of our visit). 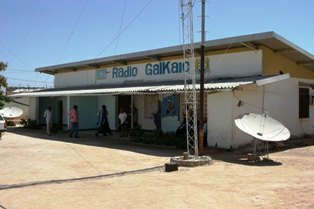 Several hams reside now in Galkayo, and amateur radio courses are planned. On 14 February we had the pleasure to personally meet and share lunch with the President of SARFEN (Somalia Amateur Radio Friendship and Emergency Network - the Somali amateur radio organisation) Mr. Mohamed Yasin Isak 6O0MY, who presented us with personal 6O licenses. Silvano was issued 6O0CW (the callsign we used for the DXpedition) in October 2004 and now received the original of his license. All other team members were happy to get a 6O0 lifetime license with the last two letters of their italian callsign (6O0MR, 6O0IA, 6O0XV, 6O0RW). The next day Sahra (the Secretary General of SARFEN, also Director of the Somalia Female Development Organisation) visited as at the guesthouse station and it was my great honor to show her how to operate the equipment that we’ll leave to 6O amateurs on our departure. I made just two contacts using my 6O0MR callsign for training purposes (not a pirate guys! ), then I gave the microphone to Sahra for the next few QSOs. Elmering a YL amateur radio student in a similar developing country is an interesting and rewarding experience. She had no time to do more radio that afternoon, but her satisfaction for the possibility to make those radio contacts was evident on her face. If it’s difficult for a Somali man to gain access to a complete HF station, it’s even more difficult for a woman. Women there have to dress and behave in specific ways, as in most of Africa. We as guests have to respect their traditions and rules without interferences, of course, because it’s their country. Our mission was to mount a DXpedition and also to help Somali hams (or future hams) with basic training and equipment donations. Their social and political issues are well behind our scope. Sahra showed us the building that should host the amateur radio society, and she told us that 25 women are already interested in attending the amateur radio courses to gain a license. We’ll stay in touch by email with them to see their progress. On 16 February, the last full day in Galkayo, the bravest two of us (Beppe and Riccardo) visited the city market with Hussein and our driver to buy some souvenirs for us, mainly wooden bells which are used for camels! It was hard for them to move in a very crowded and unruled street, with our local friends opening the way. Unfortunately our beverage antenna has been cut by someone several days before, but we were still able to make excellent QSOs on the top band until 16 February, when we dismantled the low bands station. DX activity continued until 03 UTC on 17 February, the day of our departure from Somalia. The last 24 hours we had only one station on the air. We finished with 24187 QSOs in the log and our last contact was with K7XB on 40m CW. We left our 160m antenna at 45m with 80m feedline, our six bands beam antenna with rotor, a Yaesu FT-847 transceiver, 500w solid state power amplifier, power supply, PK-232, Yaesu FT-757 transceiver, 3 VHF/UHF handhelds and several accessories to Somali hams, to help the development of amateur radio in the country. This donation was possible thanks to the generosity of our major sponsors. Before departure, Joe VA6JWT / 6O0JT (a Canadian who is active from Somalia since October 2004) visited us and we made nice photos with the flag of Somalia. Then it was time to run to the airport, really a room in the desert, no real roads to reach it! The sun was strong, as it was for the two weeks we spent in Somalia; we didn’t get any rain at all. Our old small plane arrived and was quickly filled with people and baggage of any kind. We first had a stop in Burao (in Somaliland), then Djibouti and Dubai (UAE). Here we found the same security officers and they did exactly the same with our baggage: locked until our next check-in! No worry, we slept few hours at Dubai airport, then we came back to claim our baggage and finally checked-in for Milan, where we landed on time with all our equipment on 18 February around 12:15 local time. and our many sponsors: NCDXF - INDEXA - DANISH DXG. - GDXF - MDXC - EUDXF - CDXC - GMDX – SDXF - ECO ANTENNA. - D.A.E. - ELETTROPRIMA - Printing Shop IK1PML - KEYER by I2RTF - RIZZIERI ELET.- CAVEL - CEP - FUNK - CUBICOM - IRAE2 - EDILFOND - ARI CASALE Monf. - ARI SCANDICCI - ARI BRONI-STRADELLA –VK2BVS- W5BXX - I1HJT - I1UJX - IK1AZK - IK1IZB - IZ1ESM - I2CBM - I2KMG - I2EPT - I2WOQ - IK2BLA - IK2CIO - IK2DFZ - IK2UTT - IK2UWR - IK2VIL - I4EAT - DL9RCF - K7ER - K8YC - W3AWU - W6OAT.